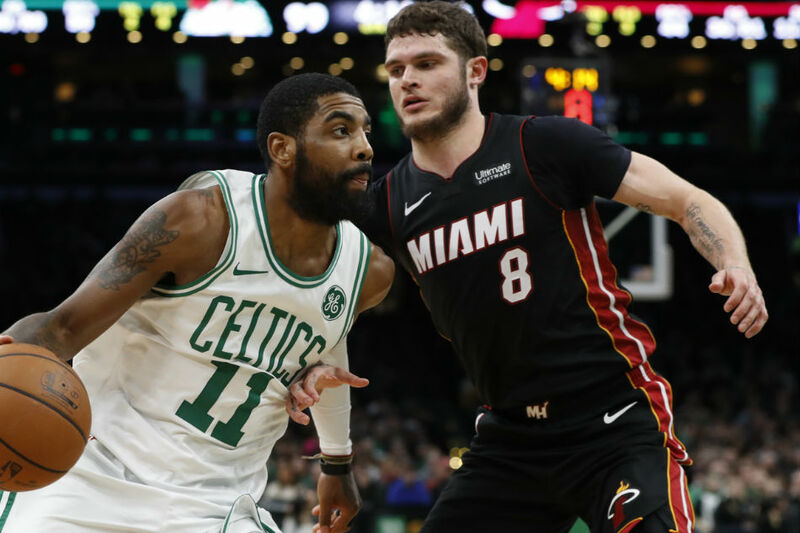 Kyrie Irving posted his 11th double-double of the season with 26 points and 10 assists, leading the host Boston Celtics to a 107-99 win over the Miami Heat on Monday night. Irving added a career-high eight steals, falling just short of triple-double. He has been hot lately, averaging 30.5 points in the four games leading up to Monday. The Celtics improved to 18-5 at home this season, including nine straight wins. Boston hasn't lost a home game since Dec. 21 against the Milwaukee Bucks. Miami, which trailed by as many as 22 points in the third quarter before rallying in the fourth, was led by two reserves. Forward Derrick Jones scored a career-high 18 points. Guard Dion Waiters, who last week complained about a lacking playing time, also had 18 points. Boston dominated the first quarter, gaining a 13-6 rebounding edge while shooting 56.5 percent from the floor and 44.4 percent on three-pointers (4-of-9). The Celtics also held Miami to 47.4-percent shooting, taking a 33-23 lead. Miami used a 22-9 run -- which began late in the first quarter -- to grab a 41-40 advantage, its first lead since 2-0. By halftime, the score was tied at 50, and Irving had had 16 points in those first 24 minutes. Boston, though, surged back in the third period, scoring the first nine points of the quarter. The Celtics did not stop there, and they cruised to an 87-68 lead by the end of the third. Boston shot 72.7 percent in the third (16-of-22). Miami's bench led a fourth-quarter rally, getting as close as five points with 4:29 left. But Irving answered with three straight Boston baskets as the Celtics prevailed.